Fr. Del Malin, as assistant pastor at the time of our church's construction, wrote the window descriptions on which this page is based. (The descriptions were revised in 2002 by Fr. Joseph Rafacz.) He referred to the windows by numbers as shown in the diagram at right. To jump directly to the information about a particular window, click on any of the numbers in this diagram. The artist who designed the windows was Prof. Anton Wendling of Aachen University in Aachen, Germany. The craftsman who built the windows was Erhardt Staettner of the T. C. Esser Glass Studio in Milwaukee, Wisconsin. Although the windows are of a modern style, consistent with the contemporary design of the church, they contain symbols that trace back to the earliest days of the Christian church. The monogram of Jesus Christ, sometimes called the Chi-Rho, is formed of the Greek letters Chi (X) and Rho (P), the first two letters of the word Christ when spelled in Greek (Χριστός). The Chi-Rho, which traces back to the days of the Emperor Constantine, represents Christ in many of the windows in our church. The Greek letters Alpha and Omega are the first and last letters of the Greek alphabet. They remind of the eternal nature of God as mentioned Revelation 1:8: "I am the Alpha and the Omega," says the Lord God, "the one who is and who was and who is to come, the almighty." A book most commonly represents the Word of God, the Bible. An open book (such as window 16A) represents truth or revelation. In the hands of an Apostle (windows 11B-11E), a book represents the writings of the New Testament. In several of the windows, folded hands are a symbol of prayer. When it appears behind a person or object, the nimbus or halo is a symbol of the divine, sacred, or blessed. The visual metaphor ties grace to light. A glow or light represents grace manifested in or through a divine or blessed person, or transmitted through or embodied in a sacred object (such as the cross of Christ, the cup of his precious blood, etc.). Beams of light also represent grace in some of the windows. The fleur-de-lis is a stylized representation of the lily, a flower traditionally symbolic of purity or sinlessness. The Holy Spirit is often represented by the figure of a dove. As birds go, doves are peaceful. If you've never watched a dove land, try it the next chance you get. Doves are big birds with heavy bodies for their size. So when they land, their wings flair broadly, and there is a sense of "settling" as they land. When you watch a dove land, you understand why the dove is a common symbol of the Holy Spirit coming over humans. In some settings (such as window 4B), the fish represents us, the people of Christ, called to be like Christ. The pelican was a Christian sign in the first centuries of the church. It symbolizes Christ in the Eucharist who feeds us with the Sacrament of his body and blood. The pelican has a long beak and a sack where it stores small fish to feed to its young. In the process of feeding, the bird appears to open its own breast with its bill. The reddish tinge of its plumage and the redness of its beak prompted the legend that it drew its own blood to feed its young. Doves looking at the host symbolize the faithful who look to the Eucharist for spiritual food. The three rays of light symbolize the grace that comes from the Holy Trinity to us through the Eucharist. Another possible interpretation of this window is that two doves, regarded in Jesus' time as a minimal sacrifice, look up to the greater sacrifice made by Christ himself. The Agnus Dei (Latin for "Lamb of God") is a lamb who symbolizes Christ, the Lamb of God. "[John] saw Jesus walking toward him and declared, 'Here is the Lamb of God who takes away the sin of the world!'" The banner of Easter victory over sin and death features a red cross on a white pennant, similar to the St. George's Cross. The blood flowing into the chalice is the blood He shed for our salvation. The stag drinks flowing water, recalling Psalm 42: "As a deer longs for flowing streams, so my soul longs for you, O God." The Lamb of God, who takes away the sins of the world, is depicted as pierced by a sword, symbolizing the sacrificial death of Christ. The Lamb of God's blood flows into the chalice, becoming the Precious Blood that we consume at the Holy Eucharist. The loaves and fish remind us of the miracle of the multiplication of the bread and fish. "After taking the five loaves and the two fish, He looked up to Heaven, and blessed and broke them, and gave them to the disciples to set before the crowd. And all ate and were filled. What was left over was gathered up, twelve baskets of broken pieces." (Matthew 14:13-21; Mark 6:34-44; Luke 9:11-17; John 6:1-15) As those 5,000 were hungry, so the people of God still hunger for the spiritual nourishment that is the Holy Eucharist. The stalks of wheat imposed on a cross symbolize the bread that Christ blessed and broke at the Last Supper. We recall his words at every Mass: "Before he was given up to death, a death he freely accepted, he took bread and gave you thanks. He broke the bread, gave it to his disciples, and said: 'Take this, all of you, and eat it, for this is my body which will be given up for you.'" During Mass, at the beginning of the Liturgy of the Eucharist, the priest says these words: "Blessed are you, Lord God of all creation. Through your goodness we have this bread to offer, which earth has given and human hands have made. If will become for us the bread of life." The bunches of grapes imposed on a cross symbolize the wine that Christ presented with these words: "When supper was ended, he took the cup. Again he gave you thanks and praise, gave the cup to his disciples and said: 'Take this, all of you, and drink from it. This is the cup of my blood, the blood of the new and everlasting covenant. It will be shed for you and for all so that sins may be forgiven. Do this in memory of me.'" During Mass, at the beginning of the Liturgy of the Eucharist, the priest says these words: "Blessed are you, Lord God of all creation. Through your goodness we have this wine to offer, fruit of the vine and work of human hands. If will become our spiritual drink." The monstrance is used to enthrone the consecrated host at Eucharistic Adoration. When we place ourselves prayerfully in His presence we receive His grace, symbolized by the rays of light. The word monstrance comes from the Latin word monstrare, meaning "to show." Symbols in this window are the cross, a bowl of bread, and a fish. Right along with the most essential of foods, for our sustenance, is the sacrifice of Jesus Christ himself. The two fish emerging from the water represent Christian people who, after baptism, yearn to approach Christ in Holy Communion. The chalice and host are the Most Holy Body and Blood of Christ which we receive as Eucharist. Fr. Douglas C. Robertson once wrote: "When our parish gathers to celebrate the Holy Eucharist, we not only receive the Body of Christ, but we also become the Body of Christ. We become the arms and legs, the hands and feet of Jesus—continuing his preaching, his teaching, and his service while building up the Kingdom he came to establish." Joseph was a carpenter whose tools included a plane, square, hammer, and nails. St. Joseph the Worker is the primary patron saint of the Diocese of La Crosse. Saint Joseph is patron of the universal church. The church of Christ is represented here and in Window 16E as a boat, making its way through sometimes stormy or unsettling seas, but always under the protection of Christ, represented by the Chi-Rho monogram atop the sail. The illustration in this window is of a fishing boat sailing as if towards the viewer, with brown hull and blue sail. The fleur-de-lis, a stylized depiction of the lily, recalls the purity of Saint Joseph. The laurel wreath, used by the Greeks and Romans as a symbol of victory, is for us a symbol of Christ's ultimate victory over sin. The stars remind us that this victory of life over death will be manifest not in this world but the next. The crown reminds us that by conquering sin and death, Christ is the King of kings: "...the Lamb will conquer them, for he is Lord of lords and King of kings..." (Rev 17:14). Folded hands touched by flame represent the souls in Purgatory for whom we pray: "Eternal rest grant unto them, O Lord, and let perpetual light shine upon them." Beams of light symbolize the grace that comes to them through our prayers of intercession. A red band separates this life from the next. Below it, the hour glass, nearly empty, reminds us of approaching death. The dove represents the soul released from the body after death, rising to the eternal reward. In the dome of the sky, representing the afterlife, a tower symbolizes God our Refuge. The crown is symbolic of Mary's role as the mother of a King. The letters A and M represent Ave Maria (Hail Mary), a prayer we pray so very often: Hail, Mary, full of grace; the Lord is with thee. Blessed art thou among women and blessed is the fruit of thy womb, Jesus. Holy Mary, Mother of God, pray for us sinners, now and at the hour of our death. Amen. The letter M superimposed on the cross symbolizes Mary's relationship with Christ; the mother who bore him, raised him, stood nearby His cross, and whose heart was "pierced by the sword" as she cradled his dead body. She challenged him about staying behind at the temple; perhaps his reply, confirming who he was, gave her the assurance to tell the stewards at Cana, over his objection, to "do whatever he tells you." The Gospels do not record the risen Christ appearing to his mother, but as the faithful son he would have done so, of course. What a moment that must have been! The dove symbolizes the manner in which Mary's son was conceived: "Mary said to the angel, 'How can this be, since I am a virgin?' The angel said to her, 'The Holy Spirit will come upon you, and the power of the Most High will overshadow you; therefore the child to be born will be holy; he will be called the Son of God.'" (Luke 1:34-35). Mary's purity is represented by the fleur-de-lis or lily. The twelve stars are her crown of glory: "A woman clothed with the sun, with the moon under her feet, and on her head a crown of twelve stars" (Revelation 12:1). The red, white, and blue shield represents Mary's role as patron of the United States. The Holy Trinity are represented by the crown of the Father, the cross of Christ, the dove of the Holy Spirit. Fifteen roses represent the 15 mysteries of the complete rosary: White for the Joyful Mysteries of Christ's birth, red for the Sorrowful Mysteries of his crucifixion, and gold for the Glorious Mysteries of his resurrection. Christ is represented in the forms of his cross, the chalice of his precious blood which was spilled for us, and an anchor, symbolizing that despite all storms, Christ is our sure hope of salvation. The "all-seeing eye" symbol speaks of the Father's omnipotence over all creation. The equilateral triangle suggests three co-equal persons in one God. The trefoil of three circles means three persons having no beginning and no end. Folded hands receiving beams of light represent grace coming to those who pray. A The green cross represents the Irish ancestry of Bishop John Patrick Treacy, the Bishop of La Crosse at the time that the church was built. The shepherd's crook and hat symbolize the bishop's appointment to shepherd God's people. The words "Thou Art a Priest Forever" remind the priest of his vocation to imitate Christ. A loaf of bread and a cup of wine from the Old Testament Melchizedech (Genesis 14:18) foreshadows the Holy Eucharist. Psalm 110:4 declares: "The Lord has sworn and will not waver: 'Like Melchizedek you are a priest forever.'" In Hebrews 5:8-10, Jesus is described as the new and perfect high priest: "Son though he was, he learned obedience from what he suffered; and when he was made perfect, he became the source of eternal salvation for all who obey him, declared by God high priest according to the order of Melchizedek." During the Mass, at the Doxology, the priest raises the cup and host and sings, "Through him, with him, and in him, in the unity of the Holy Spirit, all glory and honor is yours, almighty Father, for ever and ever." The people respond with the Great Amen. The Bishop is represented by a slate, Episcopal ring. The chalice is touched by the priest being ordained. The Chi-Rho Cross reminds the priest that he is to imitate Christ. The Book of the Gospels represents the priest's charge to preach the Word of God. At the time of the construction of St. Thomas More Church, the Benedictine Sisters were the first teachers at St. Thomas More School. The three circles and the Chi-Rho symbolize the union of the Benedictine with Christ through the vows of perpetual Poverty, Chastity, and Obedience. The fleur-de-lis represent other vows of the Benedictine, Hospitality and Stability. "Ora et Labora" means "Pray and Work," the motto of the Order of St. Benedict. The book represents the Rule of St. Benedict. The Ten Commandments are basis for the Benedictine rule of life for the love of Christ symbolized by the Chi-Rho. The Book of the Seven Seals (Revelation 5) appears, representing that a Benedictine is inscribed in the Book of Life by keeping the Ten Commandments and the Rule of St. Benedict. D The medal of St. Benedict is a cross. Inscribed on vertical are the letters CSSML, which abbreviate the Latin prayer, "Cruce Sacra Sit Mihi Lux" which means "May the Cross be the Light for me." On the horizontal is NDSMD, which stands for the Latin prayer "Non Draco Sit Mihi Dux" meaning "May the devil not be my leader." The four large letters in the arms of the cross spell CPSB for "Crux Sancti Patris Benedicti," the Cross of Holy Father Benedict. "Pax", Latin for peace, has been a Benedictine motto for centuries. E The yoke and Chi-Rho symbolize the work of Christ to which Benedictines devote themselves. The thorns and the lily remind us of the famous temptation of St. Benedict of Nursia to return to the secular life. As if to tear the temptation from himself, he threw himself on a thorn bush. It seems the designer may have intended this window to be perceived from bottom to top. Saints Peter and Paul: Peter, first head of the Church and first Pope, is given the keys to the kingdom. Paul is represented by the sword, symbolizing both his feisty apostolate and his martyrdom. The four evangelists are the writers of the four gospels. They are represented by the four winged creatures that the prophet Ezechiel beheld in a vision (Ezechiel 1:10-11): "As for the appearance of their faces: they had the face of a human being, the face of a lion, the face of an ox, and the face of an eagle." John's gospel emphasizes the work of the Holy Spirit and is written in a soaring spirit, so an eagle represents John. Luke begins his gospel with the story of the prophesy and birth of John the Baptist. His parents were Elizabeth (cousin of Mary) and Zechariah, a priest. Because oxen were often offered for sacrifice by priests, an ox represents Luke. A winged lion is Mark's symbol. The lion derives from Mark's description of John the Baptist as a "voice of one crying out in the desert" (Mark 1:3), which artists compared to a roaring lion. Matthew begins his gospel by tracing the human lineage from Abraham to David to Jesus. Since Matthew begins with human beings and the holy humanity of Jesus, Matthew's symbol bears a human face. Pentecost Sunday recalls the moment when the Holy Spirit came over the apostles. Here the graces of the Spirit are represented as rays of light. The tongues of flame that appeared over the apostles are depicted here as oil lamps. Easter is represented by the triumphant Lamb of God (Christ), who carries the banner of the Resurrection. He stands atop the Book of the Seven Seals (Revelation 5), indicating that Christ will return in judgment. Lent is represented as an open book, a symbol of learning. The three-pronged lash recalls the passion of the Christ and our call to self-denial and penitence. The fish is symbol of the fasting and abstinence of the Lenten season. Christmas is represented by the Christ (in the form of the chi-rho cross with nimbus) in a manger. Advent is depicted through the Greek "Phos Zoe" cross, formed in the vertical letters Phi Omega Sigma (spelling "phos," the Greek for "light") and the horizontal Zeta Omega Eta (spelling "zoe," which means "life"). Thus this form of the cross speaks of the Christ of Advent who comes as a light in darkness, and upon him is our hope for life eternal. The oil lamps signify that Advent is about awaiting his arrival. The pipe organ is the traditional instrument of formal worship. St. Cecilia, the patron of musicians, is sometimes portrayed anachronistically by artists as playing a miniature organ called a portative. The lyre, or shepherd's harp, was the instrument David played while composing the Psalms. Psalm 101:1: "I sing of love and justice; to you, Lord, I sing praise." The trumpet is a symbol of the Last Judgment, the resurrection, and the call to worship. Trumpets call to mind the story of Joshua and the battle of Jericho (Joshua 6) and of Gideon against the Midianites (Judges 7). Birds and chant music remind us that worship is to be joyful and reflective. The harp has been used to represent the Psalms and all music and instruments that are used to praise and glorify God. By tradition, bells call us to worship. They remind us to give worship a higher priority than our secular, everyday business. In the Catholic faith there are seven sacraments; five are depicted in this window. Other windows portray the other two sacraments, Eucharist and Holy Orders. In the Sacrament of Matrimony, two are united under the protection and grace of the Christ. Reconciliation is a sacrament of healing, repairing the relationship between a sinner and the communion of the church (and thereby God) through the rite of confession, absolution, and penance. The key and stole recall Christ's solemn words to Simon Peter: "I will give you the keys of the kingdom of heaven, and whatever you bind on earth shall be bound in heaven, and whatever you loose on earth shall be loosed in heaven." Confirmation is a sacrament of initiation into a mature, adult participation in the church. The bishop imposes his hands as he says "receive the Holy Spirit," symbolized in this window by a dove. The helmet, shield, sword, and chi-rho are symbols of the notion of the confirmed person as becoming a "soldier of Christ." Baptism is a sacrament of initiation into membership in the church. It is symbolized here by the font of water. Christ commanded his disciples (Matthew 28:19) to baptize and declared the absolute necessity of baptism (John 3): "Unless a man be born again of water and the Holy Ghost, he can not enter into the Kingdom of God." A (Alpha) and Ω (Omega) are the first and last letters of the Greek alphabet, symbolic of the eternal nature of the church founded by Christ, the true Alpha and Omega. The book and lamp signify that the church is to bring God's grace and eternal truth to the world by preaching the Gospel. The pillar or rock (Peter) represents the foundation of the church, and the four streams of water represent its attributes: One, Holy, Catholic, and Apostolic. The four smaller crosses represent the four gospels. The calling of the church is to bring the Good News into the world. The large cross is that of Christ, flanked by the crosses of the two thieves who were executed with him. Folded hands represent prayer. At the church's founding, Peter (the fisherman, represented by a boat) is its leader. The church is energized by the Holy Spirit, represented here as a dove, the wind in our sails. The Papal Crown is symbol of More's fidelity to the apostolic lineage, whose authority was inconvenient to King Henry VIII. In 1527, Henry instructed Thomas Cardinal Wolsey to petition Pope Clement VII for an annulment of his marriage to Catherine of Aragon. The pope steadfastly refused such an annulment. 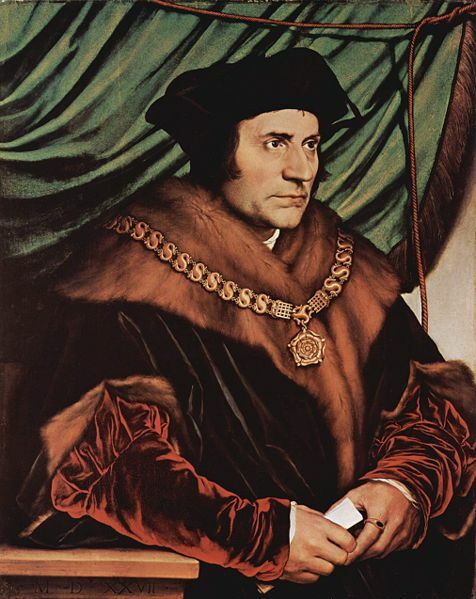 Henry reacted by forcing Wolsey to resign as Lord Chancellor and by appointing Thomas More in his place in October 1529. (More accepted reluctantly, as he was the first layman to hold the post.) Henry then began to embrace the belief that the Pope was only the Bishop of Rome and therefore had no authority over the Christian Church as a whole. The stage was set for More to be compelled to make a terrible yet glorious choice. The laurel wreath (as in window 6A) represents the victory of the martyr over death. The sword symbolizes the manner of More's execution; on 6 July 1535, he was beheaded at the Tower of London. (The actual instrument was more likely an axe.) More had received the usual sentence for high treason—a gruesome death by drawing and quartering. But Henry commuted it to beheading, imagining it a show of mercy to an old friend. The sword represents the manner of More's death. The Cross is symbolic of his faith and the reason for his martyrdom. The inverted crown suggests that in ordering the death of Thomas More, King Henry VIII perverted any and all of his claims to ecclesial leadership. More's first wife died in 1511. More remarried almost immediately so that his children would have a mother. His second wife, Alice Middleton, was a widow seven years his senior. The intertwined rings and water jars (as at Cana) are symbols of marriage. 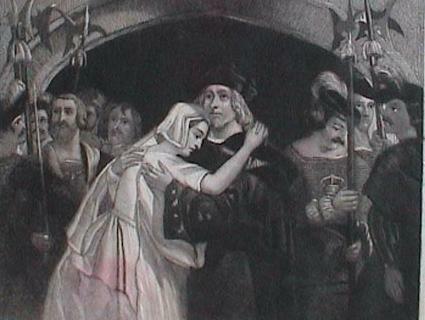 In 1505, aged twenty-seven, Thomas More married his first wife, Jane Colt. The marriage was happy and they had four children; Margaret (known as Meg), Elizabeth, Cicely, and John. Unusual for the time, he put as much effort into educating his daughters as he did his son, declaring that women were just as intelligent as men. The Tower of London was a royal prison in which More spent over a year because he refused to take an oath of allegiance to an Act of Parliament called the Law of Succession. More acknowledged Parliament's authority to establish Anne Boleyn as Queen, but could not accept language in the law's preamble which denied the authority of the pope. In July 1535 he was tried for high treason, convicted on the basis of perjured testimony, and sentenced to death. The nimbus in the sky over the tower reminds us that even in that forbidding place, More's soul was under God's protection. In 1515, Thomas More wrote his most famous and controversial work, Utopia, a novel whose primary message is the need for order and discipline rather than liberty. The society described is almost totalitarian, and very far removed from present day ideals of freedom. Later, when he became Lord Chancellor, More vigorously opposed and suppressed the rising tide of papal separatism. For More, heresy was a disease, a threat to the peace and unity of both church and society. The cap above the book is a style then popular among scholars. Pictured here is the necklace of the Lord Chancellor, an external sign of the office More held from 1529 to 1532. The pendant is a Tudor Rose, representing the House of Tudor, of which Henry VIII was a member. Inside the necklace is a cross symbolizing More's unyielding adherence to his faith. (If there is symbolism to the green background, it is not known.) In the end, More regarded loyalty to Christ and his Church, seated in the authority of the pope, above his responsibilities as Chancellor, even above his own life. The scepter, scroll, and official seal are symbols of More's office as Lord Chancellor of England. That office entailed being the King's chaplain and also became known as the "Keeper of the King's Conscience." In 1530 More refused to sign a letter by the leading English churchmen and aristocrats asking the Pope to annul Henry's marriage to Catherine. In 1531 More attempted to resign after being pressured to take an oath declaring the king the supreme head of the English church "as far the law of Christ allows." In the scales of justice (doubly symbolic because More was trained in law), the authority of the King (represented here by a crown) is outweighed for More by the authority of the faith. More repeatedly denied any malice toward the king. Just before the fatal blow he addressed onlookers, asking them to pray for the king and proclaiming, "I die the King’s good servant, but God’s first." Knapp, Sr. M. A. Justina, OSB. Christian Symbols and How to Use Them. Milwaukee: The Bruce Company, 1935. Rest, Friedrich. Our Christian Symbols. Philadelphia: The Christian Education P, 1954. Van Treeck, Carl, and Aloysius Croft. Symbols in the Church. Milwaukee: The Bruce Company, 1960. West, Edward N. Outward Signs: the Language of Christian Symbolism. New York: Walker and Company, 1989. Our thanks to Tom Thibodeau and Therese van Oss for their help in the research.